International Non-Olympic University-INOU has been received several well wishing letters, faxes, e-mails that came from the figures and leaders in the Worlds of Leaders around the Globe, H.E. UNO, H.E. European Union, H.E. President, Hon'ble Prime Minister etc., some words of affection and honour resound in our hearts. Dear Professor Dr. Mohammed Seraj ANSARI-Rector-INOU: On behalf of the Secretary General-United Nations, appreciates your kind offer in recognition of his achievement, Nevertheless, allow me to take this opportunity to convey his best wishes for success to your institution. I would be greatful if you could convey this response to Dr. Mohsen Mehralizadeh, former Vice President of Iran and chairman of the INOU Supervisory Committee. Dear Professor Dr. Mohammed Seraj ANSARI-Rector-INOU: It is a very honoured and appreciates your organization innovation. Best in your future endeavours. Dear Professor Dr. Mohammed Seraj ANSARI-Rector-INOU: I was very impressed to see the innovations that you have made. Dear Professor Dr. Mohammed Seraj ANSARI-Rector-INOU: I would like to congratulate the INOU innovation..
Dear Professor Dr. Mohammed Seraj ANSARI-Rector-INOU: I wish your effort and acknowledge your receipt. Best wishes to your organization development. Dear Professor Dr. Mohammed Seraj ANSARI-Rector-INOU: It is with great pleasure and appreciate your new innovation and wish all success to the university in the days ahead. Member,Industria de Dise�o Textil, S.A., Spain. Dear Professor Dr. Mohammed Seraj ANSARI-Rector-INOU: First of all I sincerely appreciate your efforts and new innovation! Congratulations on this new concept of the world. Dear Professor Dr. Mohammed Seraj ANSARI-Rector-INOU: It is a great pleasure for me to receive your letter. We appreciate the kind invitation and best wishes for your further development of your institute. Dear Professor Dr. Mohammed Seraj ANSARI-Rector-INOU: On behalf of Mr. Abramovich, I would like to thank you for taking the time to write. Nonetheless, we are grateful for your attention and would like to wish you and your colleagues every success in the future. 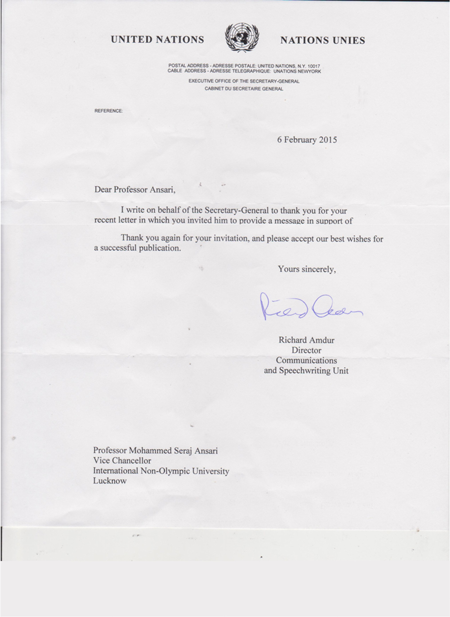 Dear Professor Dr. Mohammed Seraj ANSARI-Rector-INOU: I would like to appreciates your intiatives and thoughtfulness. Good Wishes for INOU Team. Dear Professor Dr. Mohammed Seraj ANSARI-Rector-INOU: I would like to wish you every success in your future work.